I was told about the Dynamo in passing conversation last year just after buying my first “real” bike. The idea of cycling from London to Dunwich (20 miles south of my hometown) through the night following tea lights and red lights captured my imagination. I knew I wanted to take part once I thought I was up to the challenge. The Dunwich Dynamo is an annual semi-organised event where cyclists travel from Hackney in London, through Essex and into Suffolk to the coastal village of Dunwich. The event is overnight and takes place on the Saturday closest to the full moon of July. 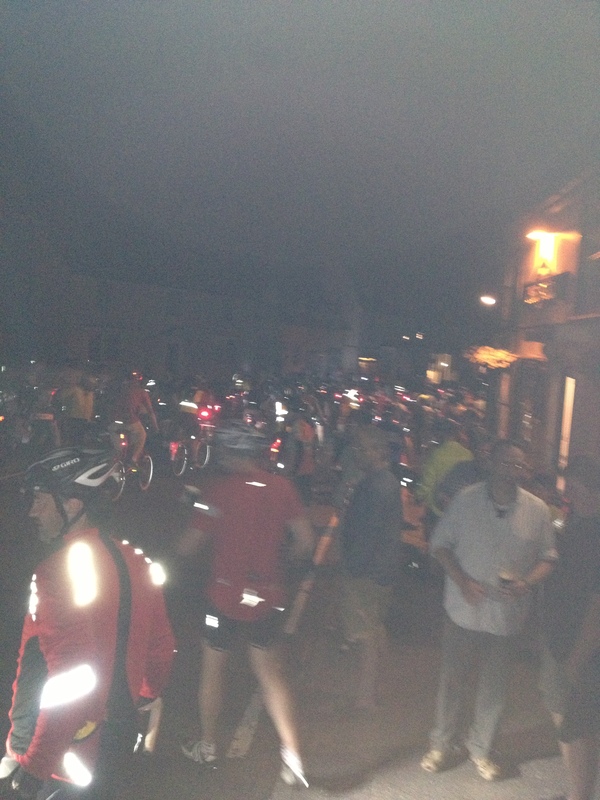 The first Dunwich Dynamo (DD or Dun Run) was completed in 1993, making this year Dun Run 21. 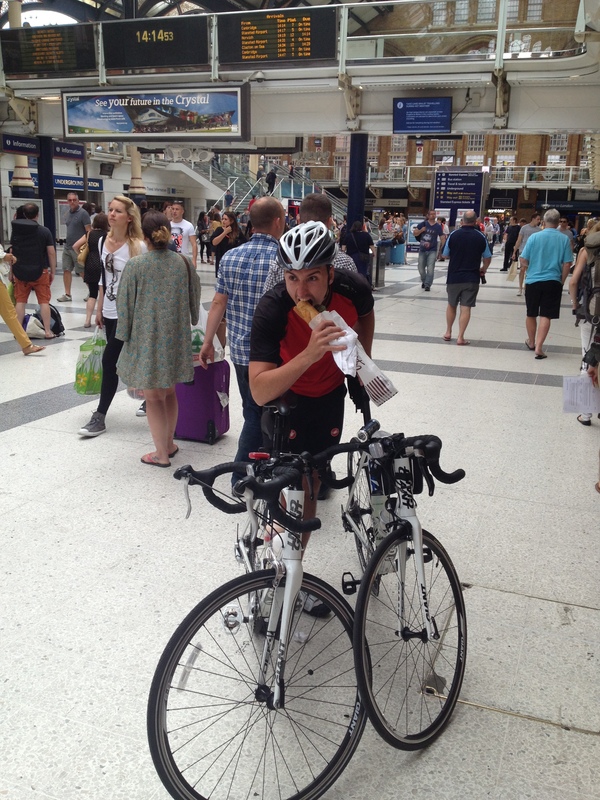 We swap trains at 12:50 at Ipswich, this train has a carriage just for bikes and its massive. We load up our bikes with no problems, loads of room left. Arrive in Liverpool Street. Time for some more carbs! 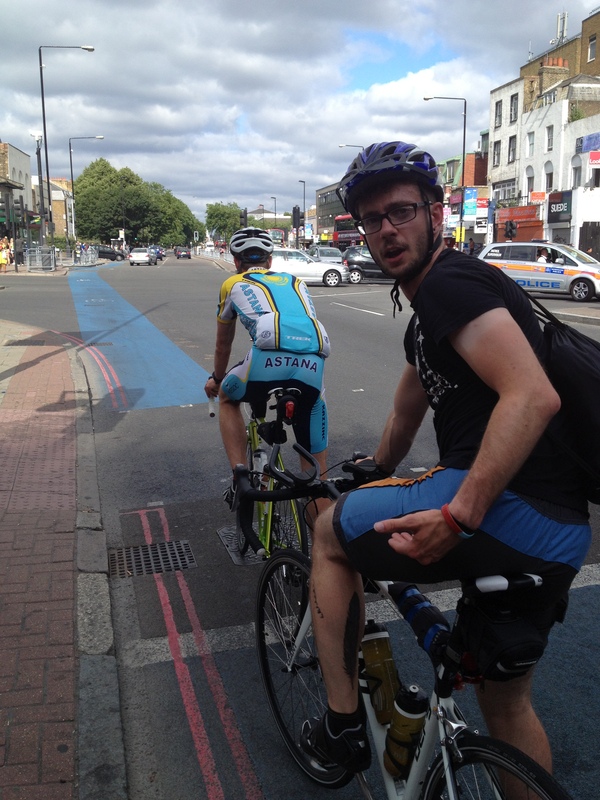 Head off past the Barbican to Old Street in search of a bike shop to re-true my rear wheel. Arrived at Look mum no hands café / shop in Old Street. As we walk in the Tour is going strong with loads of locals and some Dynamo runners supporting Froome. The bike workshop was open and the guy behind the counter said he would be happy to re-true my wheel. So I grabbed a smoothie and let him get on with it. 10 minutes later he tells me its too loud with the Tour on to do a proper job, but he has got it more true and there would be no charge, top bloke. He said I should come in during the week, I didn’t have the heart to tell him I’m not local. Anyways time for a smoothie. 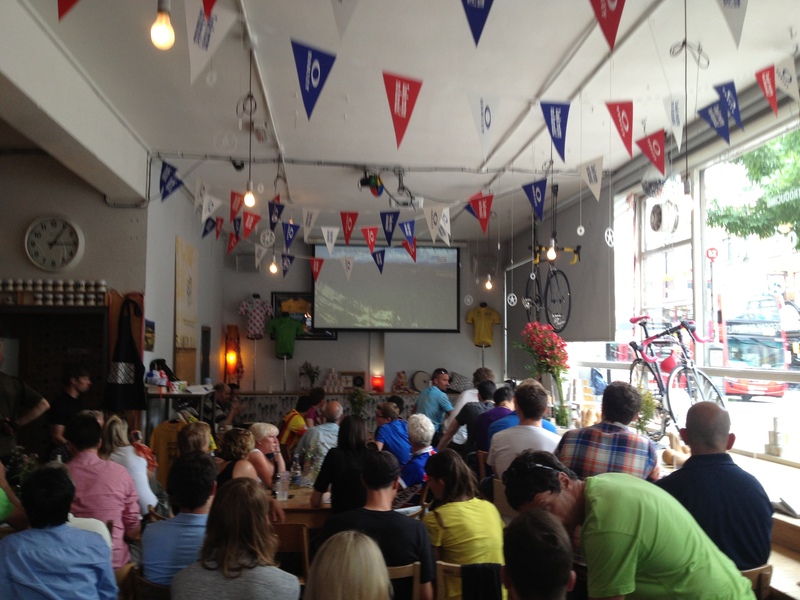 We are all stood watching Froome nail this stage on the tour. I am ready for this ride! Froome comes in third but what a ride by him and Quintana. Easy future LTFD winner. The cafe is now deserted. 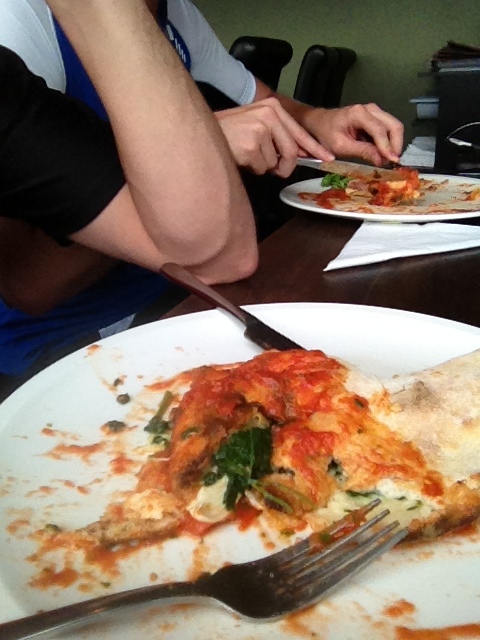 Time for a calzone to fuel the ride! 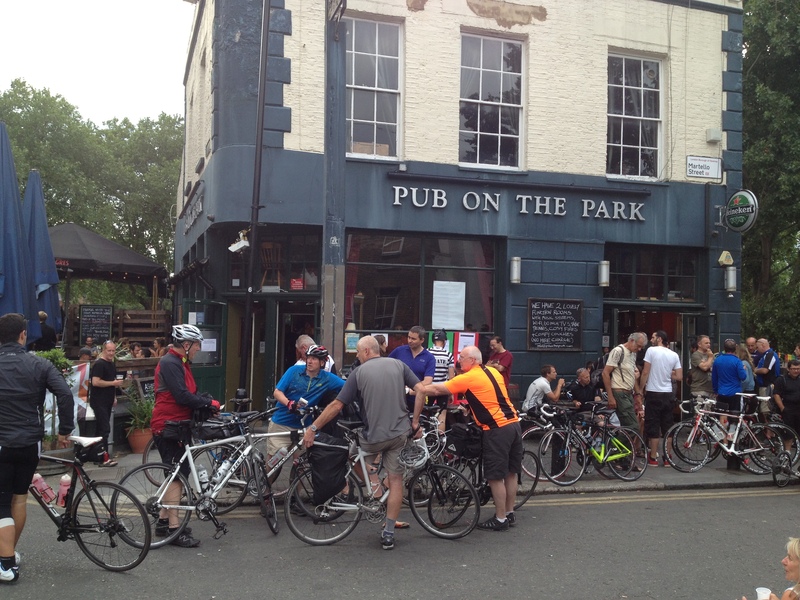 We arrive at the pub in the park, its already getting packed. We make our way into the park to relax and make last minute adjustments to our bikes. Walking through the park we saw the guys attempting the Dynamo on Royal Mail bikes, the guy with the spaniels who we wished luck to (I am nervous about just getting myself to the finish let alone 2 spaniels as well!). We decided to make our move after watching an exodus of cyclists from the park. The Dynamo was beginning! We slowly made our way out of the park two by two, slightly bottle necked by the park railings, but who cares! We all walk slowly chatting away, occasionally asking passers-by “Where is your bike?”. One of the bigger discussions is packing; some look more prepared than others, me with my parcel taped gels, and another with his masking taped bananas and then the pros with their large seat bags. As we get to the starting point you can hear the beeps of the Garmin’s and cycling apps. The ride isn’t a race, but it’s bloody nice to review you ride the next day on Strava or any other cycling app. We all get into the road and prepare mentally for what is to come. I was slightly worried about the winding route through London being a country boy. I shouldn’t have been, the sheer number of cyclist’s means it is near impossible to get lost! The route is windy, going through the houses a bit (maybe we went the wrong way). But it’s all in the spirit of the ride. As we ride we hear beeps from the cars, beeps of encouragement from the opposite direction, beeps of anger from the cars we are slowing down. Soon we are out of the main hustle and bustle of London. 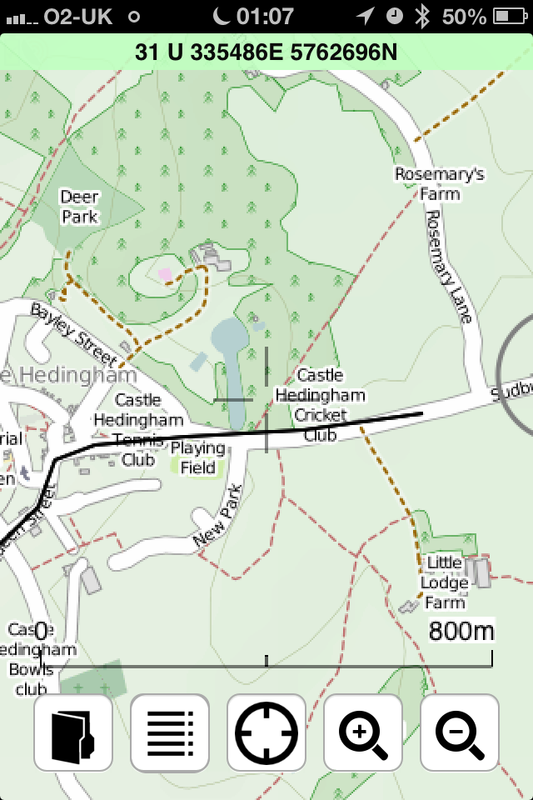 Now it’s time to tackle some hills, these kind of took me by surprise even though I reviewed the route beforehand. London, Essex and Suffolk are flat, what are these hills doing here!! Epping hill descent pot hole madness. The descent after the Epping hill climb was nice, cruising down after a nice slog. However, this was short lived close to the roundabout by a rather large pothole, that I didn’t notice. Unfortunately Ian did with two blown inner tubes. 10 minutes later we discover who has the best pump and that Ian has never changed an inner tube. At least the group has been reunited and ready for the next part of the journey. We are 45 miles into the ride. I made a friend who works in the city designing hedge fund banking software, and lost all my friends. I spent the next 20 miles on my own jumping from group to group hoping to see some familiar faces. I was starting to lose hope of seeing my friends until Dunwich, so I felt it was time to make some friends and chat to anyone who would listen. 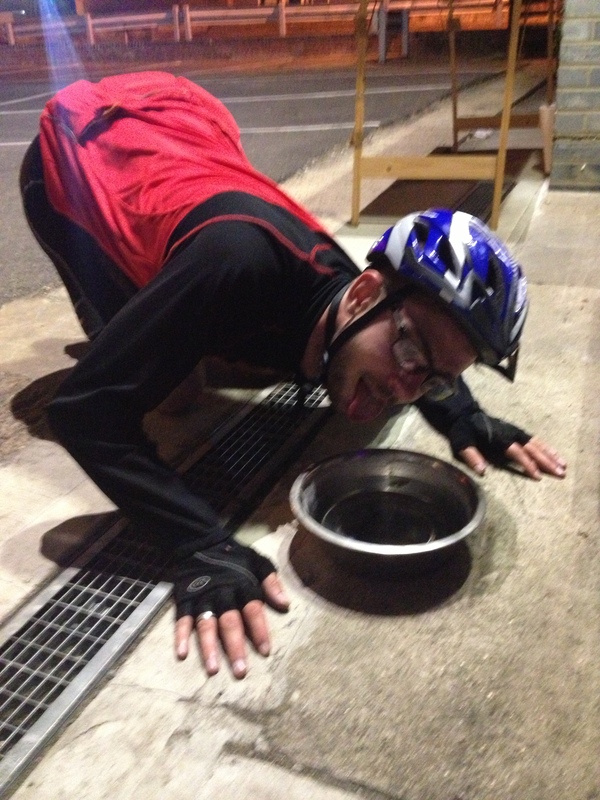 I get talking to this guy and we get onto pot holes (maybe the topic of the eve), just as I am explaining how Ian blew both his inner tubes I see a guy with two inner tubes round his torso. It’s bloody Ian, sods law, I thought I wouldn’t see him again and there he is! To be fair I was happy to see him and him me, we had a nice old ride ahead of us still and it’s better to do it with someone you know. 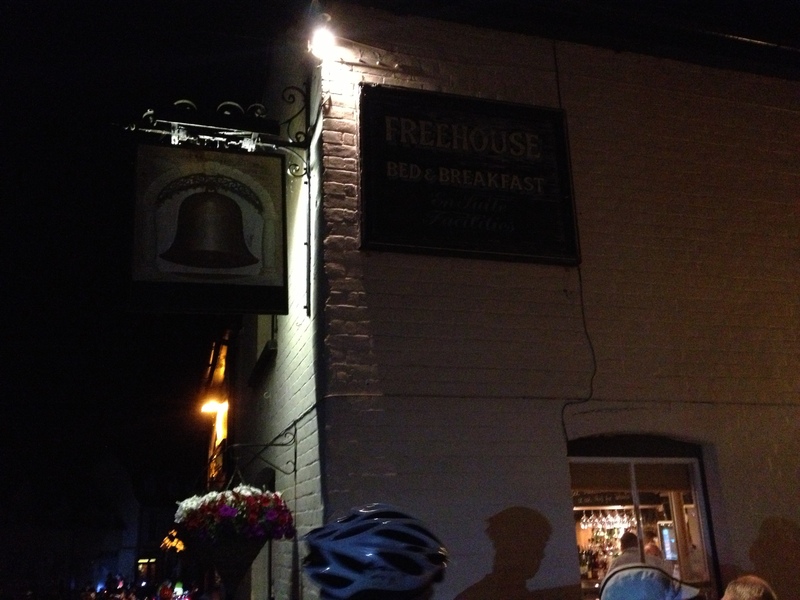 We biked together to the next pub (unsure of the name but it has a Bell in its sign, maybe the Bell?) 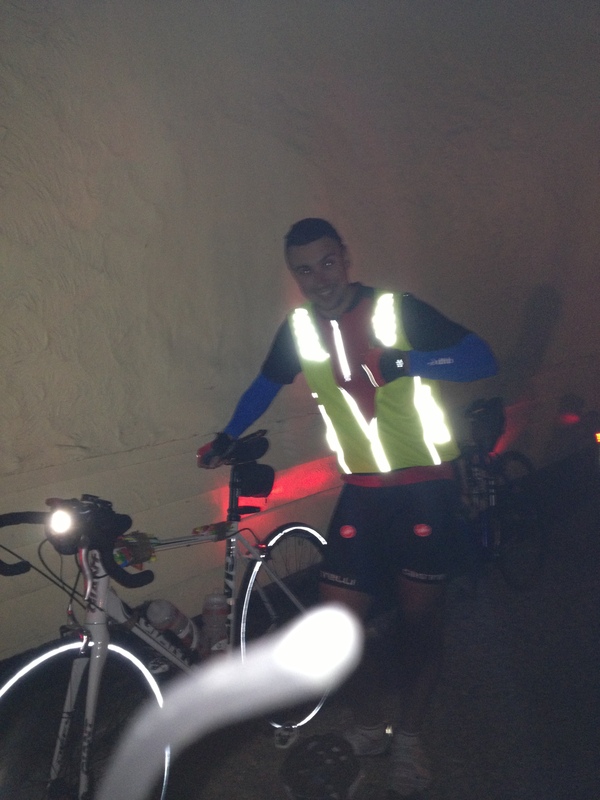 and stopped for a well-deserved Tea and Mars bar, I was saving the coffee until the early hours. 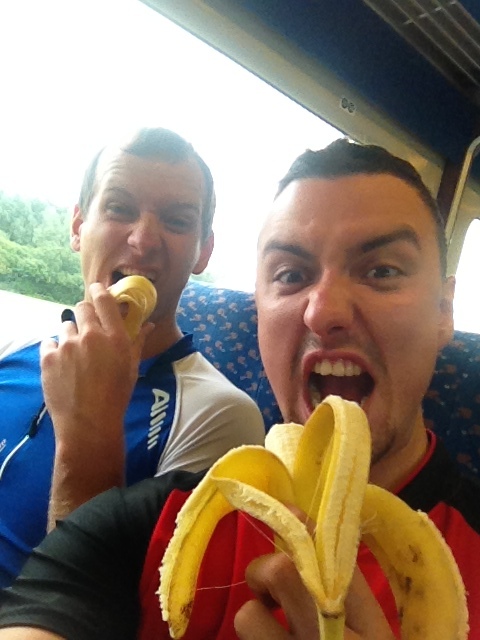 We hear from the others, they are 10 miles ahead, so back on the bike we go! Diversion! Seems like half the road is being pulled up through this small village. We have to get off our bikes to walk over a temporary bridge and along a field to the road again. It was nice to stretch the legs, but the best bit was looking back and seeing all those blinking lights. I will not forget them flashing red lights, ever! After the diversion I had a quick gentlemen stop, telling Ian I would meet him at the half way point at the village hall. Bad idea, I blasted through the village not even noticing a village hall sign and ended up waiting at the top of some hill. Great! The descent into Sudbury is a blast! I must admit I did slowdown in fear of another large pot hole that would throw me off the bike. Kyle on the other hand got in his newly fitted Tri bars and flew past me, balls of steel! In Sudbury we turned left and onto the pit stop at the Torque cycle shop. 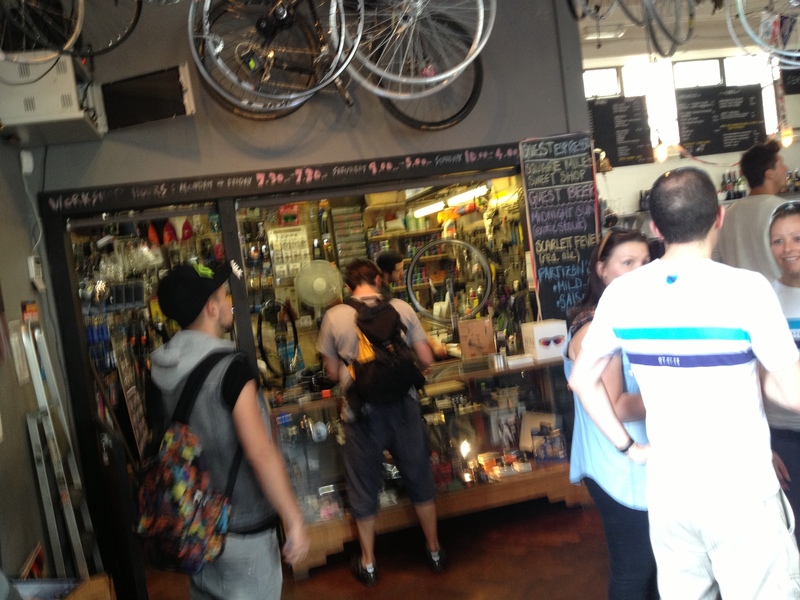 Ian popped in for some more inner tubes with fear of pot holes in his mind while the rest of us had a water stop. I don’t think Kyle realised there were taps inside! It’s early / late depending on how you look at it and we happen stumble / cycle across a sausage stand. We have to stop, the smell is too much to take and it wouldn’t be bad to refuel the body for the next 35 miles (78.8 miles completed). I found myself sprinting up every climb for the last 30 miles, the energy seemed to come from no were or possibly the energy gels? I did feel little guilty passing groups of riders, but I think they soon got the idea as they passed me as I waited for Ian, then I would sprint the next hill. 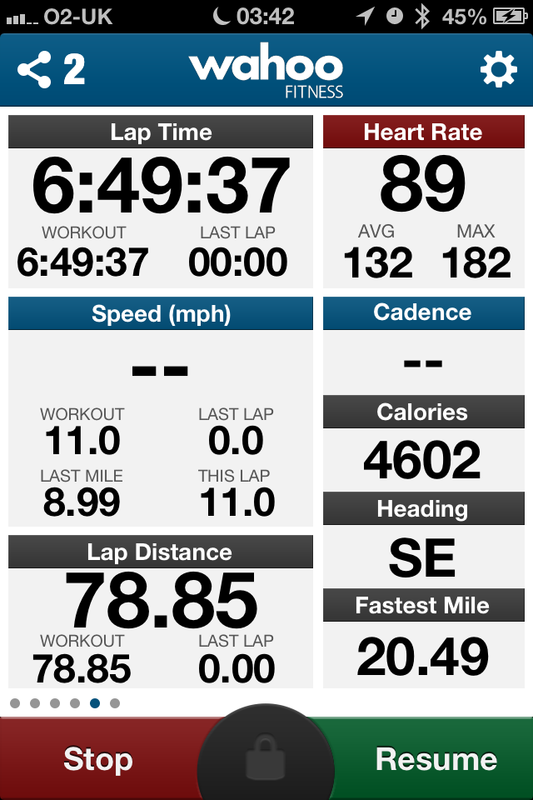 I don’t think interval training is the best idea at the end of a ride! 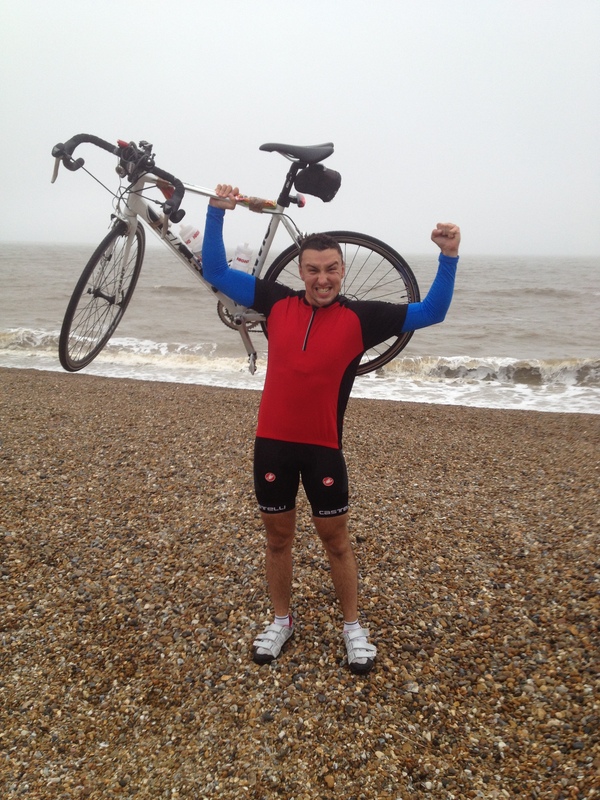 Ian and I rode side by side for the last 5 miles, passing that Dunwich sign was like heaven, we were so close! As we peddled in the sun light we passed the guy on the Penny Farthing, what a sight! I gave him the thumbs up, to which I received a smile, I thought this was hard on the road bike! Getting close to the beach we were greeted by a number of locals holding a banner stating “You have done it!”. They gave us words of encouragement, telling us we had done it and the beach is just round the corner. That was a really nice touch J. The whole journey was full of these “nice touches” (not in that way), little things that spurred you on, like the family just out of London with the children shouting “allé allé” or the guy at 5 am in his dressing gown with a cup of coffee in one hand and his cat in the other. Those moments will stay with me forever, however, new ones next year! The sea was close, I had smelt that salty sea air for the last hour and here it was. We unclipped and made our way over the pebble beach (I still prefer the golden sands of my home town Lowestoft though! 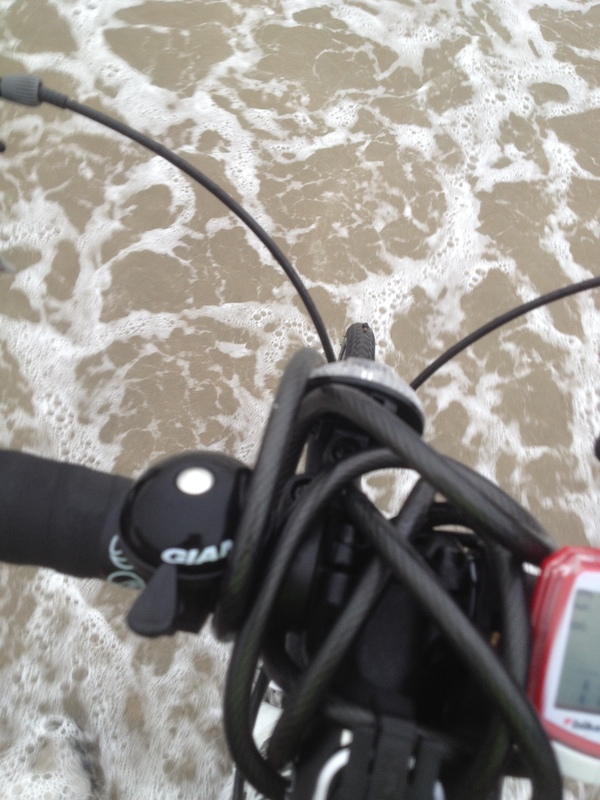 ), I had to go dip my tip (again not in that way) in the sea to say I had finished. So that was it, after a few pictures we sat down and tried to take it all in, the miles we had ridden, the sites we had seen, the punishment we had put our body clocks through, what a great night. 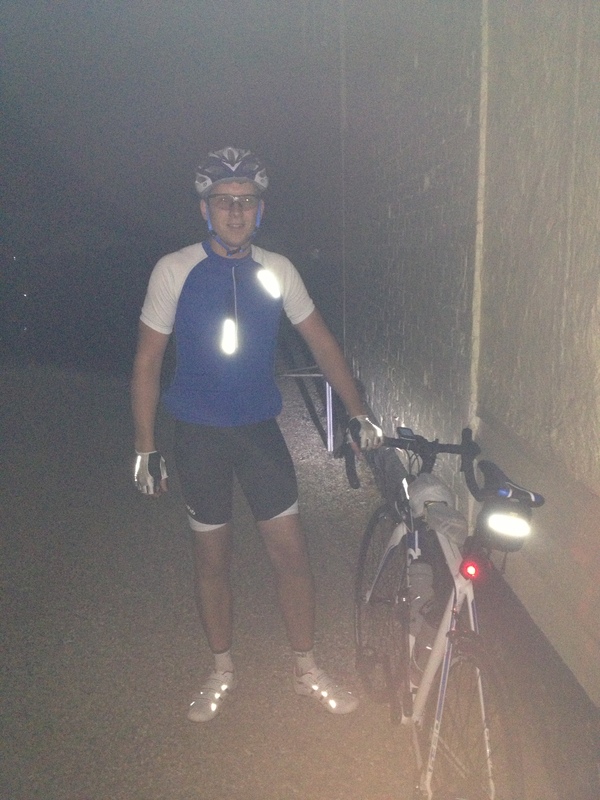 What an amazing night of riding, I am extremely happy I took the plunge and road the Dynamo. A great night, great route, great people. 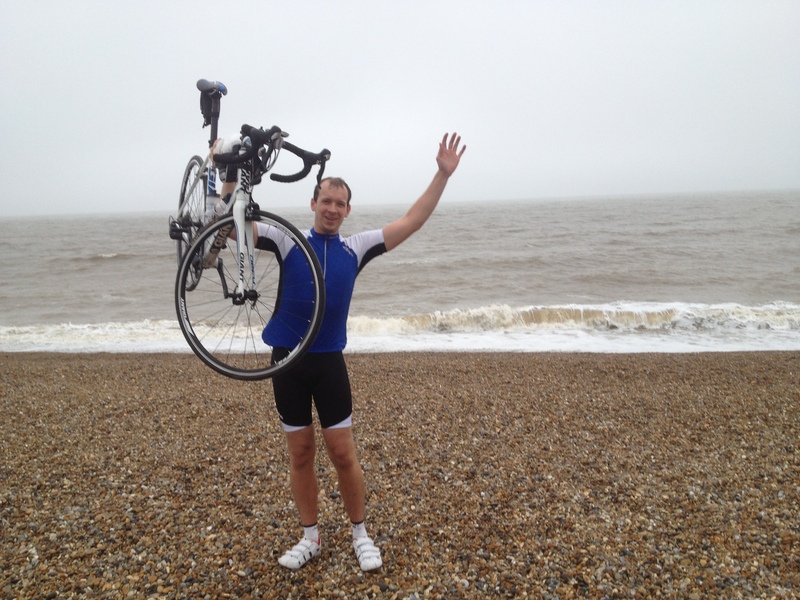 Now to stop that coastal erosion so the route stops getting shorter! A quick thank you to the organisers / non organisers, the pubs, the volunteers, the people, Thank You! A good quality front light is vital for seeing them pot holes in advance. Sleep is nice, the Dynamo is a necessity. It’s not as hard as you think, but do a few longer rides beforehand. Losing your friends isn’t the end of the world, most cyclists are friendly. If you think your lost, stop, wait for the stream of flashing red lights, continue. Eat, Eat, Eat! I cannot emphasise enough how important it is to keep your body fueled, whether it be via powders (I used the Hi5 race pack for nutrition) or bacon butties! Drink, Drink, Drink! Water, keep hydrated, I would recommend at least 2 bottles in your bike cage. Fill up at the next stop if you can, maybe try some hydration tablets (like High5 Zero electrolyte tablets) these help to replace the minerals you lose during perspiration. Communication is key, let people know when you are slowing down or changing road position. If unsure how best to signal that just shout it out “Slowing down!”. Pot holes – Not fun, can buckle your wheel, burst you inner tubes, jar your wrists or throw you off. 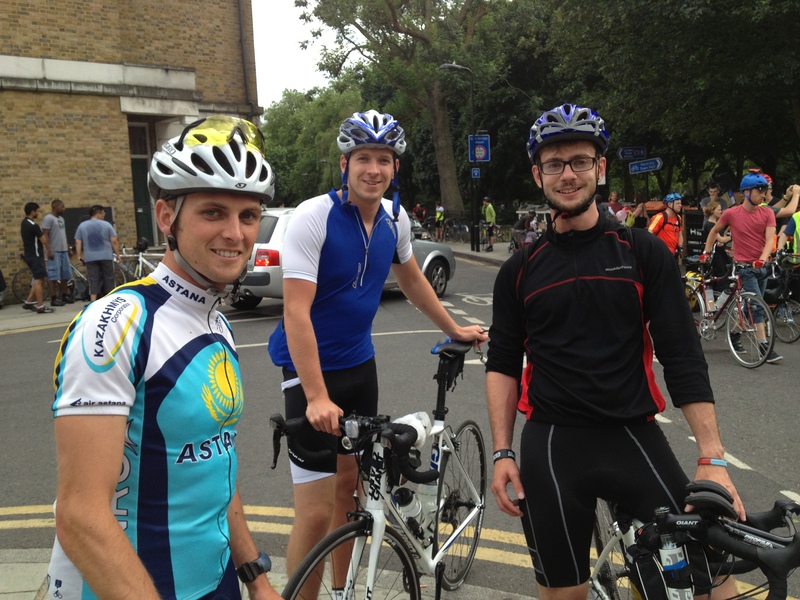 Your fellow riders, if someone looks like they are in a spot of bother lend a hand; you might just save their evening! Being addicted to the event after one ride!